In Latin, the word acervus means a heap or a mass. These things exist because of a build-up of various smaller parts; humans are essentially the same. As humans living each moment, we are constantly coming in contact with different sensory experiences. All of these experiences; the people, places, and information that enter into our lives, no matter the longevity or the positivity of the thing, each of these experiences will affect us and contribute to our decisions and our existence in some way, at some point. Each adds a layer. We are all accumulations. I have woven a 15 inch by 180 inch piece of cloth that has two nine inch holes evenly spaced in the center, out of hand spun raw tassar silk, fuzzy white mohair, and beige wool to represent this thought. 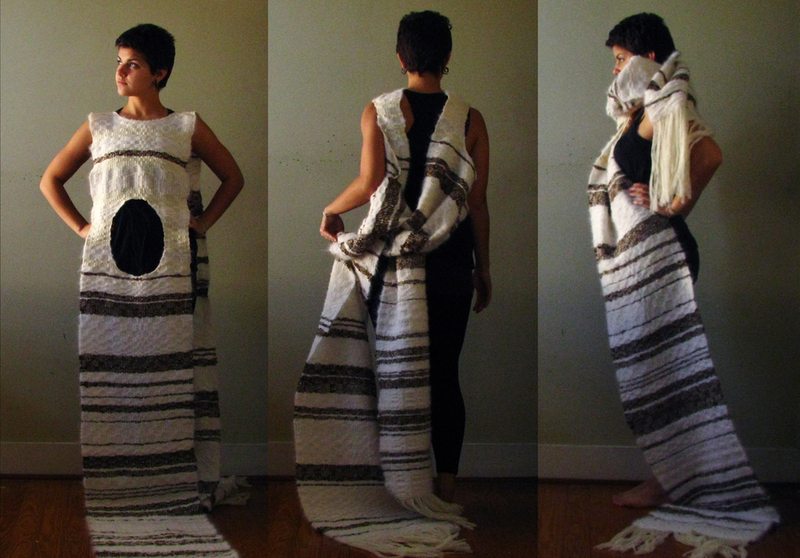 It is a wearable piece that is made to be comfortable in both warm climates. The cloth is made long so that it will always drag the ground. I plan to wear the piece to many places that I travel; it will eventually accumulate the things that follow my path. In a sense, the cloth will never be completely finished, but always morphing and building, just as we do as humans.